We celebrated World Book Day last week, so it is only apt that we should be reviewing a couple of lovely children's books by Little Tiger Press this week. Not that we need an excuse to read books in the C-house. 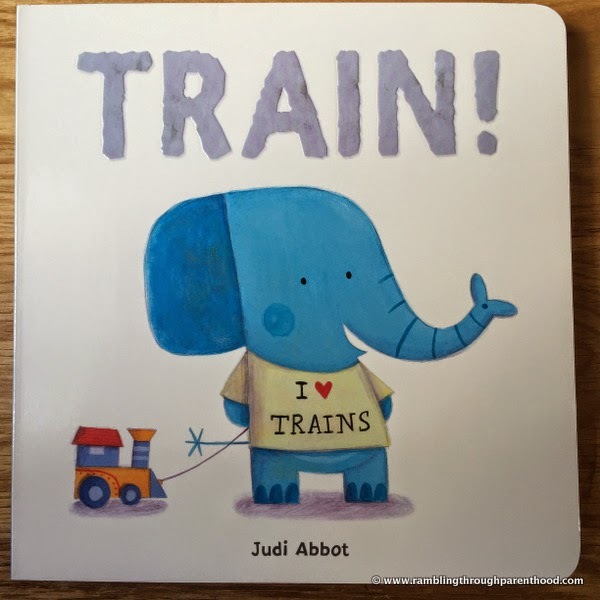 First up is a cute little board book called Train written by Judi Abbot. This award winning title was available in paperback, but is now available as a board book due to popular demand. Quite rightly too. The audience it is aimed for means that it is more likely to survive in its current hard board format. For here is a book that is certainly going to be a hot favourite with little ones if my J's reaction is anything to go by. We have had a reading every day since he first set eyes on the book. By the way, Train is the one word J can now sound out and write down all by himself (other than his own name, of course). So he knew what the book was about even before we had read it. The story is something every parent will identify with. It is about a little Elephant who wants to play with trains. But Cat wants plane, Penguin wants his car and Rabbit loves diggers. So what did they end up playing with? Or did it end in tears? Were there tantrums along the way? That is the plot of Train waiting to unfold. It is a simple yet beautiful story about children's behaviour. It could help a child understand the importance of sharing, taking turns and playing nicely, something all children struggle with from time to time, but which we as parents need to reinforce patiently but firmly till the message sinks in. The other book we reviewed this week was Zip It from Little Tiger Press. It is a fun board book to help children get the hang of everyday fastenings. It uses bright, bold animal pictures and simple rhymes to allow little fingers to come to grips with fastening buttons, using a zip and tying laces. I would think this is more suited to ages 3 and up. It is perfect for preschoolers learning to be more independent. I do have a little worry about this book. It is beautiful, no doubt. And the idea behind it is clever too. It is just the robustness or the lack of it, that worries me. J was happy to use the zip and the velcro fastening. But one tug on the shoelaces, and we had a small tear through the page. He also managed to dislodge the cat's collar after a few attempts at opening it. If this book is to really serve its purpose of teaching little ones the art of everyday fastenings, I think it needs to be a lot sturdier. Having said that, it is still lots of fun. And a novel way of introducing the rather mundane concept of fastenings. See how J got on with the zip on the frog. Disclaimer: We were sent copies of these books for the purpose of this review. All opinions are my own. I love the look of that Zip It book - it looks like a lot of fun. Rrrr I have seen a few people on about this it does look so good. The Zip It book looks great, I'll have to keep an eye out for that for my son. My kids love books and I love the look of the zip one although would worry with my boy being quite rough with things like that, would be such a shame if he broke it! 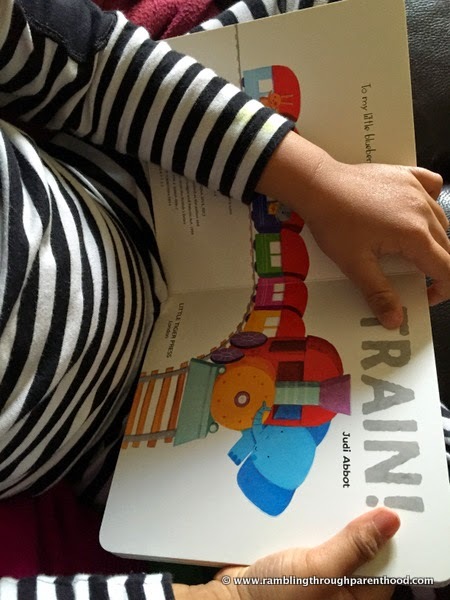 Sebby would love the train book........off to find it on amazon! I have not heard of these books. They do sound like a lot of fun. Much more realistic than fairy stories. oh this looks fantastic and so great to help learn too! .. bonus! Zip It book looks very interesting; I've never heard about it before. 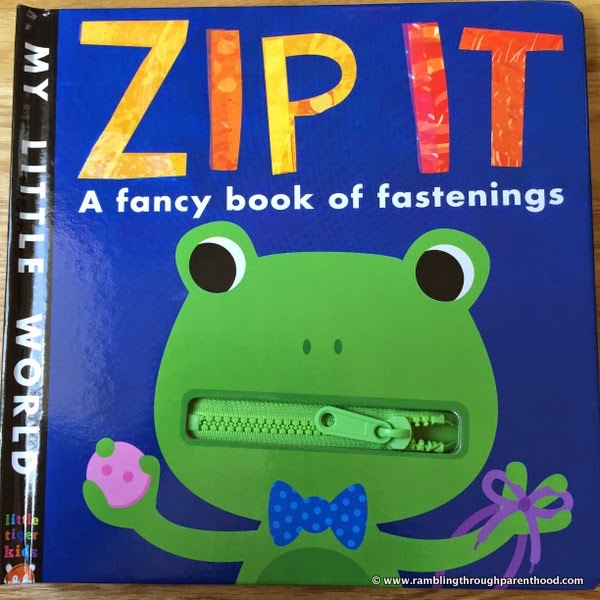 I love that zip it book - what fun, my youngest would love it. Ooh myst get my son that fastenings book - he is starting school in September and is an August born so will be one of the youngest in the year - he still struggles with buttons and bows especially! The train book looks gorgeous and the zip one...what a fab idea. Mine would have loved that!